I’ve learned that no matter how much I care, some people just don’t care back. 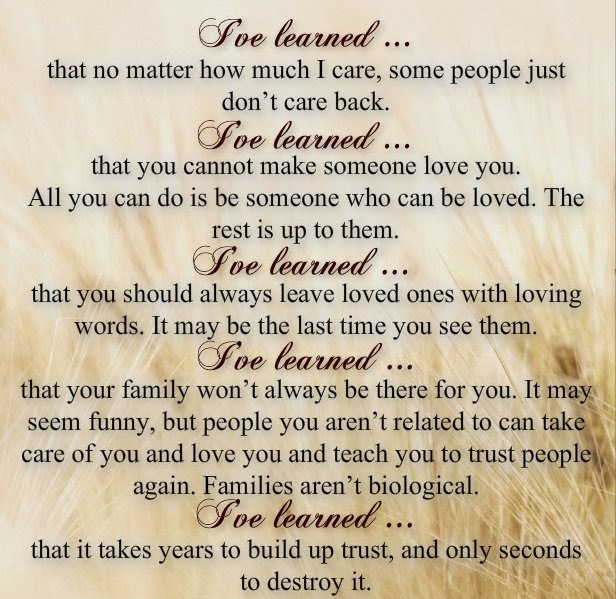 I’ve Learned that you cannot make someone love you. All you can do is be someone who can be loved. The rest is up to them. I’ve learned that you should always leave loved ones with loving words. It may be the last time you see them. I’ve learned that your family won’t always be there for you. It may seem funny, but people you aren’t related to can take care of you and love you and teach you to trust people again. Families aren’t biological. I’ve learned that it takes years to build up trust, and only seconds to destroy it.